Odisha’s people are very much believe in lord Jagannath, and Puri is a highly visited religious tourist destination of Odisha, here many festivals and ceremonies are celebrated throughout the year but Car Festival is something different, for Car Festival Tour in Odisha thousands of foreign tourist from America, London, Paris etc countries visit Odisha, also millions of Hindu people gathered at Puri for famous Car Festival Tour. This is the festival in which lord Jagannath, Balabhadra and Maa Subhadra go for a tour to his aunt’s house on car or chariot Ratha. Tourist mesmerized by watching a huge gathering on Puri load on this holy festival. Early morning take your breakfast and full day visit of “World famous Jagannath Rath Yatra’ at Badadanda (Vehicle will be a park in parking places selected by local administration, you have to visit Rath Yatra by walk from parking Place). Overnight at Puri hotel. 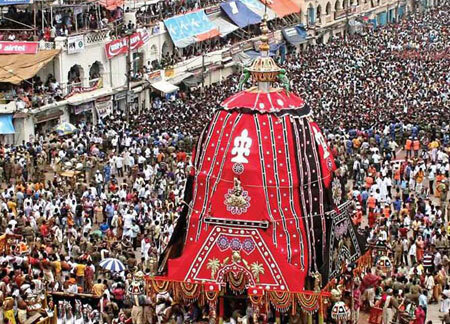 (Rooftop tickets are available for enjoying Rath Yatra and ticket cost will be extra). Take your breakfast and proceed to Satapada Chilika Lake, enjoy Boat Cruise to see “Dolphins” & “Scenic island” inside Chilika Lake, back to Puri , free time shopping at a Local market. Overnight at Puri hotel. Take your breakfast, check-out from hotel proceed to Konark, en-route visit Chandrabhaga beach then visit Konark Sun Temple (World heritage site and one of seven wonders of India), latter proceed to Bhubaneswar (Capital city of Odisha) on the way visit Pipili (Applique Market), Dhauli Peace Pagoda (Famous for historical Kalinga war), Lingaraj Temple (As per your time permit) then drop at Bhubaneswar Airport / Railway station for onward journey with sweet memories of Jagannath Dham (Odisha).